I just wanted to send an email to you to thank you for all your assistance with supplying and building our shed. I cannot recommend Rainbow Garages highly enough. From the point of first contacting your company 6 or so months ago with my initial enquiry, you have walked through the features & benefits of your product over others. You identified what we required to meet our brief, and outlined clearly the process from ordering, receiving and erecting the shed. All of which, I am so happy to report, went exactly to plan. The quality of your product is second to none, many people have commented on how solid and strong it is. To have a one stop shop that does all the (council) paperwork and permits, makes it easy for those who have not had experience in this. I would also like to make a special mention of your installers. During a site visit I was fortunate enough to meet them and was taken aback with their professionalism, cleanliness and just how extremely polite they were. Very rare. Again Nick, thanks to all at Rainbow Garages, and please know I would be happy to talk to any potential clients who may be contemplating using your services. I just wanted to thank you and your team of installers for getting our new calf shed finished in such a short time period. I'm really pleased with how it looks and I can't speak highly enough of your customer service, a really great experience from start to finish, I will certainly be recommending you to others. I have attached a couple of pics of the finished shed. I Am a bit slow in replying to thank you for the help in the completion of our carport. I was extremely happy with all aspects in the ordering, help in colour choice, and the delivery time. Have had plenty of barbies in there and our three dogs love it. Have a few photos of the finished project attached. I am writing to thank you for the excellent work you did on replacing our garage after a fire and explosion. Your workers were excellent in what they did, also very happy and polite men. The project is now complete. We are very grateful. I found Rainbow Building Solutions to be a very professional and easy company to deal with. They were easy to communicate with, responded to all emails in a timely fashion, returned phone calls and thorough in preparation. All my questions were answered and the processes were explained. Josh and the team were a pleasure to deal with. I am very proud and satisfied with my new 3 bay garage and car port. A quality building built in good time. I would not hesitate to use them again or refer them to friends and family. Thank you Rainbow for a brilliant job. We had a vision for a custom garaport using legacy infrastructure inherited from the previous owner. After canvassing our ideas to several shed builders, it was Pete from Rainbow Building Solutions who was able to provide a design that truly matched our vision. The builder, Viv Oates, then took that design and delivered a finished product that has left us very happy customers. Thanks guys. My partner and I have experienced flawless service from Rainbow Building Solutions from the initial quote stage to the completion of our garage. We have found them to be professional, efficient and extremely friendly throughout the process and the finished product looks fantastic! If you’re after a quick build but a sturdy, well-structured, good looking product then I highly recommend Rainbow to you. Thanks to Rainbow Building Solutions for designing and supplying our shed. We are very happy with the results and appreciate the helpful advice we received as we explored the many design options. We currently live remotely from our property in Lucaston, so we were looking for a company who could provide a complete shed package - including site works (e.g. concreting), gaining approvals and construction - with minimal input from ourselves. After receiving five quotes, it was clear from the outset that Rainbow Building Solutions offered the better deal, it was more integrated, well considered and comprehensive. While at the high end of the price range, they very clearly included everything in the package. We are both professionals fairly skilled in project delivery, tasks and outcomes. It is thus with some authority that we can say we were very impressed with Nick Smith’s (RBS Sales and Project Management) professionalism, friendliness and competence. He provided high quality drawings and contracts, and kept us up to date at all stages of approval-gaining, site works and construction. We would have no hesitation using this company again or recommending them to others. The customer service of Nick and his team at Rainbow Solutions Kingston was fantastic. My request for a custom shed build with a slab pour in a difficult location was met with solutions while still maintaining very completive pricing. A fantastic finished product and the process from start to finish was very professionally managed which gave me confidence all the way through. Rainbow handled the provision of my 6m x 8m shed (workshop) as a total package from council approval to erection. I was kept fully informed at all stages as the project progressed. I am delighted with the end product and can thoroughly recommend Rainbow, both for their product and their professionalism. I must compliment Rainbow Building Solution for their service and support in supplying a great new shed. 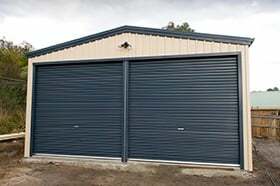 For someone who has just moved to Tasmania and needed a shed ASAP the help and support of Peter Clark of Rainbow Building Solution at Kings Meadows helped me through the process and provided an excellent builder. I am delighted with the end result and would certainly recommend Rainbow Building Solution for a hassle free shed design and build. We have now built two sheds with Rainbow. In both instances we have been very impressed with their service and quality workmanship. We would highly recommend them. If you are having a garage built, Rainbow Building Solutions are a great team to work with. and I now have a garage that compliments my property perfectly.